CerMark LMM-6060 creates a rich, black color when laser engraved on to a wider variety of metals including steel, stainless steel, brass, bronze and aluminum. LMM-6060 has increased adhesion capabilities and is recommended for polished aluminum and chrome products. The next-gen water based formula has a neutral pH factor and will not stain metals when applied. 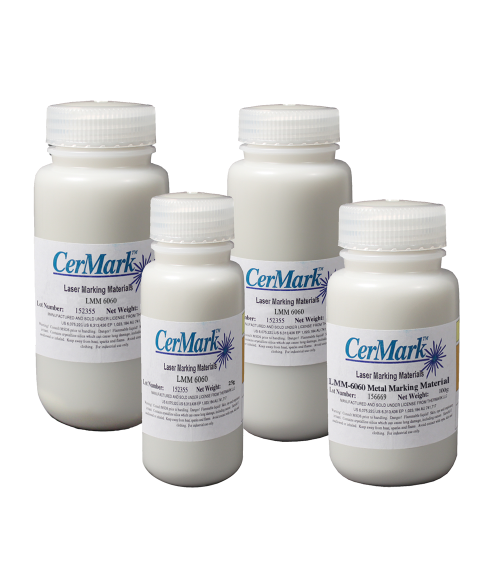 An important safety factor is CerMark LMM-6060 dries hard to the touch and not to a powder form. The un-engraved CerMark LMM-6060 is safe to go down the drain when washed with water. Available in 25g, 100g, 250g, and 500g bottles.